The Vineyard is pleased to announce our two new Vintners Reserve Wine Kits are now available. Diablo Rojo - Dark purple in colour with a nose of blackberry jam melded with creamy vanilla aromas, and a touch of tobacco. Rich in the mouth, it has gently smooth tannins and ripe plum and berry flavours--very much in the character of an off-dry Merlot. The finish is long and fruit-filled, with the perfect amount of toasty oak. While it will improve with ageing, this wine is perfect for enjoying right away, delicious with robust foods and excellent all on its own. 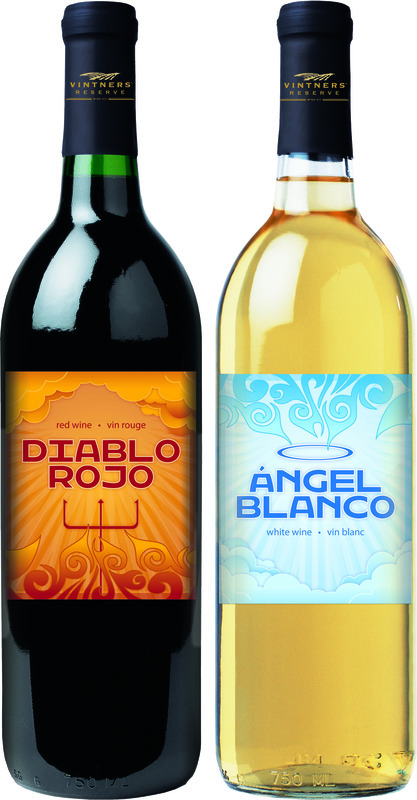 And Ángel Blanco - An easy drinking, well-rounded white wine, with appealing fruit flavours and aromas. Rich and boldly fruity from a blend of Chardonnay, Muscat and Riesling that delivers up a floral aromatic nose and a fine mix of peachy, honey, pineapple fruit finishing with a perfect balance of acidity and fruitiness. Serve well chilled before dinner or pair it up with spicy foods to tame the heat and compliment your cuisine.